Considering that until a few months ago, I was following a vegan diet, you can imagine the struggle I went through when I started learning about collagen powder. Collagen powder is made from animal by-prodcucts including the skin and bones. It’s tough for me to think about, I’ll be honest. When stopping to think about it, however, if I am already consuming animal products, there really isn’t much difference. When cooking with fruits or vegetables, I do my best to use absolutely every part of the food itself. Sometimes that means composting the peels of bananas or shells of eggs. Waste not, want not. Unfortunately, cooking has changed so much and with products like boneless wings and chicken breasts, a lot of humans aren’t getting the collagen from their meats that they normally would. Collagen production in the human body begins to decrease after the age of 30 (I know, big shocker…the age of impending doom.) Along with collagen our bodies start slowing in the production of other proteins like elastin. The slowed down production of these two proteins means a lot for our bodies as we age. Loss of collagen structure in our bones is most commonly known as Osteoporosis. Not only does our skin change, but our joints weaken and muscle loss starts to happen more often. Not only this, but collagen production helps support the tissues that connect our organs. Sounds like a blast, right? The good news is is that there are so many things we can do to boost our collagen production. What does collagen powder do? 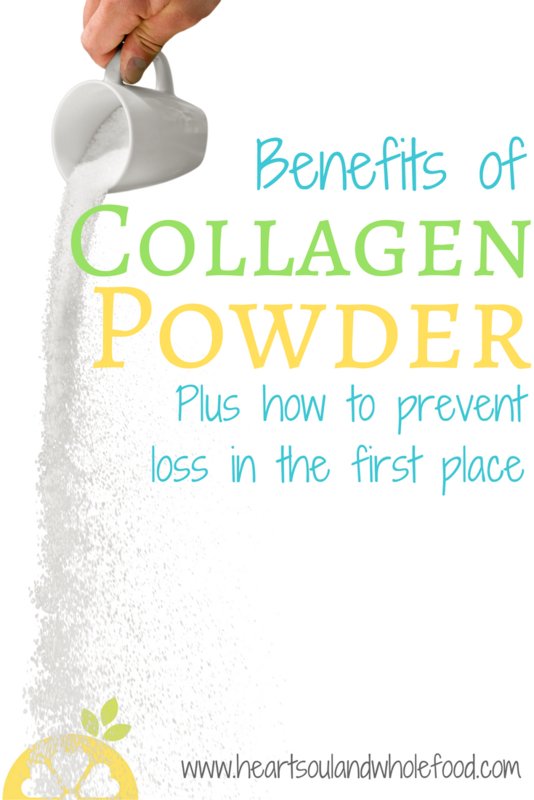 The thing I like the most about collagen powder is that it is not an injection, it’s non-invasive and it has nothing to do with medication use. Like I said, collagen powder is made from parts of the animal besides the meat. This powder is composed of long chain proteins that our system breaks down into amino acids. Once they are broken down, those amino acids start to build our collagen back up. Now I’m going to get totally honest with you. Collagen production can be boosted by introducing powders and collagen products into your diet, but it will never fully restore it to what it once was. It seems fair really, we can’t completely cheat aging. I don’t know about you, but I’m cool with slowing it down a bit. You can get collagen powders and supplements in certain stores, or you can always order online from Amazon or Thrive Market. Click Here to get 25% off and FREE shipping on your first Thrive Market purchase. There are becoming more and more products available to help boost collagen. I prefer the powder because it is easy enough to just scoop into my morning smoothie. Check out some of the other available options. You’ll even see vegan friendly products, which I absolutely love! I was also super excited this week to learn that Thrive Market has a great promotion going on through July 2017! An order of $29 or more means you can score a 12 pack box of chocolate Primal Kitchen Bars containing grass fed collagen COMPLETELY FREE! Click the image below to take advantage of this awesome deal. What else can you do to help your collagen out? I’ve said it before and I’ll say it again, I don’t believe in quick fixes when it comes to our health. It’s all about lifestyle changes and making good choices for your health every day. The best way to protect your collagen is to avoid losing it in the first place. Similar to any health struggles, it’s better to just avoid problems in the first place. Just like the rest of our bodies, this all starts with good nutrition. A diet dense in vegetables, proteins and fats ensures that you will be getting those amino acids that your body needs to continue creating collagen. Along with those amino acids, a diet with a good amount of vitamin C will help as well. Then there’s the gym. Yes, exercise helps stimulate HGH (Human Growth Hormone) which helps stimulate collagen production. This doesn’t mean endless hours on the treadmill either. In fact, the best workouts could be under 30 minutes. It’s recommended that HGH production is highest with resistance and endurance training. You can do this through weight training or cardio workouts like HIIT which promote full body workouts and cardio at the same time. Avoiding smoking will help ensure the health of your tissues and organs including your skin. Studies have been done on identical twins who lived in the same climate, had the same job, same hours and eating habits. The twin who had the smoking habit aged significantly faster than the twin that didn’t smoke. Making sure to get a minimum of 7 hours of sleep per night will help slow down the aging process as well. Doctors even recommend sleeping on your tummy to prevent dynamic wrinkles. Avoiding sun exposure with sunscreen, sunglasses and hats will help protect collagen in your face and around the eyes. It’s also important to remember to avoid being outside during the sun’s hottest hours (between 1 and 3 pm.) It’s also important to make sure to wash your face in the morning and evenings and to use a great exfoliator at least once a day. So while collagen powder is by no means a quick fix or a total repair, it can assist in keeping your body going stronger longer. Also taking the time to keep up with your all around nutrition will help far more than your collagen production! Check out these few other favorites to help avoid collagen loss in the first place.